At more than 5,000 branches and over 2,000 self-service locations in all 50 states, you can conduct transactions just like you would at Via Credit Union. That's because we're part of the CO-OP Shared Branch network. So you can make deposits, transfers and account inquiries, and get person-to-person assistance with your accounts, even when you're far from home. 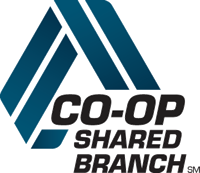 Simply look for the CO-OP Shared Branch logo. Finding the nearest branch is easy with locator tools that include phone, mobile app and Internet. Just visit www.co-opcreditunions.org or call 1-888-SITE-CO-OP.